Pima County officials joined Pima Animal Care Center’s jurisdictional partners, committee members and advocates to unveil Phase 1 of the new Pima Animal Care Center facility on Thursday, Dec. 28, during a ribbon-cutting ceremony. County voters approved bond funding for this new facility in 2014 through Proposition 415. The proposition authorized the county to borrow up to $22 million to improve the original shelter, which was built in 1968. 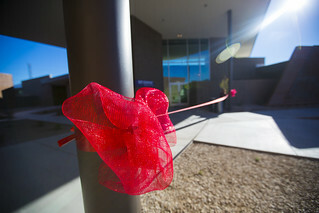 PACC’s new building, which is located just east of the old facility, marks the completion of Phase 1 of construction. Led by Pima County Facilities Management, Phase 1 came in ahead of schedule and under budget. Highlights of the new building include a state-of-the-art veterinary clinic for routine and emergency care, indoor/outdoor dog housing, group cat housing and isolation spaces for optimized disease control. In addition, the new space offers fresh air and natural lighting, well-designed plumbing and cleaning systems, separation of species from arrival to adoption, and a large, multi-purpose room for orientations, classes and animal-related programming. Following the ceremony, PACC staff led several groups on tours through its new facility. Sundt Construction contractors have already begun work on Phase 2, which involves the remodel and partial demolition of the old shelter. The second half of the project will be completed in summer 2018. Speakers included Sharon Bronson, Chair of the Pima County Board of Supervisors, Supervisor Ramón Valadez, District 2, Pima County Administrator Chuck Huckelberry, Assistant County Administrator Francisco García and former PACC Advisory Committee Chair Jack Neuman. Auerbach was the event’s Master of Ceremony. For more information on PACC’s modern animal care campus, visit the Phase 1 webpage.